-Ability to define page count, page length, page width, segments, gap between pages and effect areas-max angles of benders. -Preview option, before actually binding every page. -Ability to take apart all or some of the pages and provide them random directions. Note that in preview option only one frame is keyed, and you control its motion scrubbing timeslider. I cant be hold responsible for the trouble it may cause, so please use it on blank project, or at least backup your project before use. -Bug Fix regarding to the Torn Apart options. Now it torns apart pages even if the default in/out tangents are different than linear. -Ability to turn the following page, before the previous one lands (shuffle) It is added as Shuffle Control to the master controller. It is also animatable. now its very easy to create a book which pages starts to turn slowly and speeds up gradually until it shuffles very fast. -Added Crease center options for Flexibility, Turner and Landing parts. It allows greater control over creases. -Added Crease Level for Turner part which allows changing altitude of crease. It also make possible 360 degree turns properly. -Added Material section. You can assign double or single sided materials. 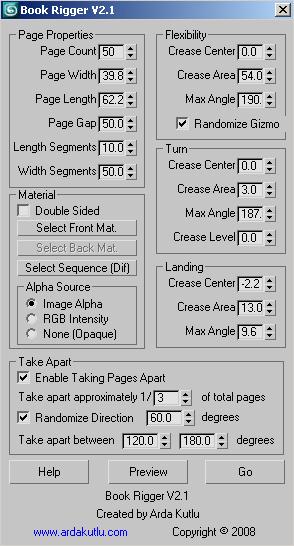 It is also possible to assign an image sequence and Book rigger makes every pages diffuse texture the corresponding frame number of that image sequence. -More options to taking apart function. (defining the area -like from the 10th to 25th page- of pages that will be taken apart, defining the time range, Gradually increasing and decreasing the pages that will be taken. -Book cover with various styles. Next How to batch render in Max with all render engines? estou precisando muito do aplicativo book rigger. Não estou conseguindo achá-lo na rede. Alguém pode me passar um lin k que consiga baixar. Superb inormoatifn here, ol’e chap; keep burning the midnight oil. Sorry, just me again…I can't seem to get off your comment page! !Did I ever tell you that I have a grandson DREW, too?? :O)and two more and 7 granddaughters and one great granddaughter….AND, would you believe, your verification word right now is DISHES.